Dr. Robert Gelles and staff welcome you to our website where you can familiarize yourself with our practice. 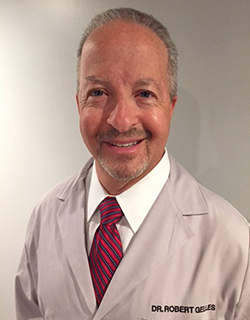 Dr. Robert Gelles has been serving the South Suburbs of Chicago since 1983 in the field of Podiatric Medicine and Surgery. He is a Diplomate of the American Board of Foot and Ankle Surgery and a Fellow of the American College of Foot and Ankle Surgeons. We have two convenient locations in Palos Heights and Blue Island. The doctor is on staff at Palos Health (formerly Palos Community Hospital), MetroSouth Medical Center, and South Suburban Hospital. He also performs outpatient surgery at Ingalls Same Day Surgery in Tinley Park. Dr. Gelles is a board certified specialist in podiatric foot and ankle surgery with over 30 years of practice experience. He concentrates on reconstructive foot surgery, diabetic foot care, diabetic infections, and a variety of foot ailments. Dr. Gelles attended the Scholl College of Podiatric Medicine. He practices in the south suburbs of Chicago and is on staff at Palos Health (formerly Palos Community Hospital), MetroSouth Medical Center, and South Suburban Hospitals.